I didn’t expect to be making another build so soon, but I wanted to do a small update based on the Build 48 feedback and then it gradually morphed into a pretty big update. I said previously that I wanted controller support to be in the next build but that didn’t actually make it in here. It is in progress and will be in the next one for sure. One of the main complaints I have heard since the launch is that the game is too tedious (grindy?) so I wanted to try and address that issue in this update (at least a little bit). The main change here is that encounter outcomes that don’t result in a tactical battle but do have a positive outcome result in experience gained for each character on the team. The amount will be equal to the base experience earned on a mission of that difficulty. I also heard several complaints of slowdowns and crashes in Build 48. My main finding was that with the changes to add the open levels in Build 48, I needed to spend some significant time further optimizing the game. I started with some basic changes but this quickly moved into creating a larger scale object pooling system. The improvement seems to be pretty significant! 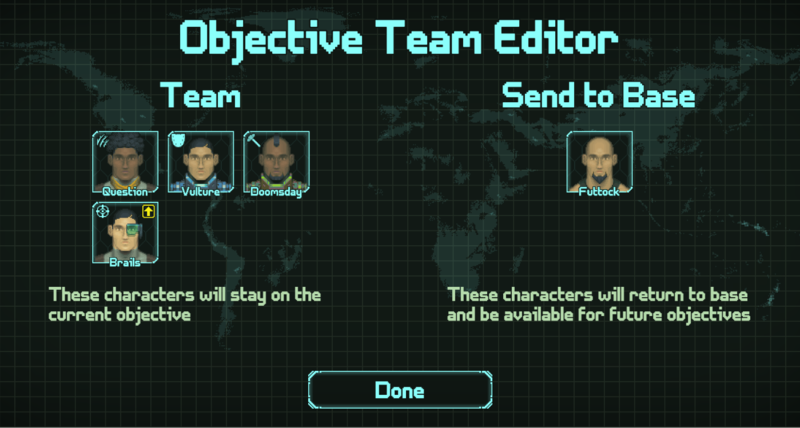 A new “Team Editor” screen that will appear after a hostage mission if you have a full team. This will allow you to choose the team member to return to base rather than always sending back the hostage. The “expected damage” will now appear on a character or cover UI flag by turning the health dots red that would be damaged in a successful attack of max damage (in the case of multi shot weapons). This should make it more clear how much damage a successful attack will deliver to an enemy. Add the dodge chance to the enemy UI flag. If the enemy can potentially dodge the attack, then it will display below the hit chance in yellow. Abort Mission button is larger and also has discrete states for the different options you have to choose from in cases where you leave the mission early. The sniper range penalty is now fixed to 4 squares rather than 50% of the weapon range. This should reduce the overly high penalty area for later game weapons with a higher range. Incompatible items were not labeled as such in the equipment UI. Now if you have a ballistic weapon equipped, energy items will be labeled as “incompatible.” This will also apply to heavy weapons for characters that can’t equip them. Starting in Build 49, I now have integrated a fantastic new system for reporting bugs and crashes. Players won’t have to fill out the Google form and track down logs and save files any longer. 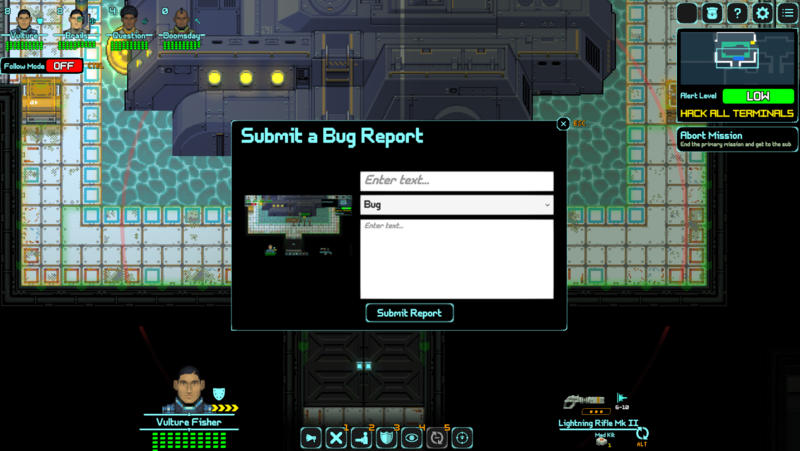 Now you just click the “create bug report” button in game and type in some details about what happened. A screenshot is automatically captured and the log and save files are also sent along with the report. I’ll also get a ton of other data about the memory use, your graphics card and other system specific stuff. Nothing is collected that could personally identify any player. This should make it much easier for players to report issues and for me to fix them. There were also a number of bugs reported with Build 48 and even some older stuff reported previously, or that I just noticed. The terminal location on the reactor is not obvious so it gets a cue animation like the doors. Cursor would change over invisible enemies and items letting you know where they were on the map. Door could be opened when in follow mode and not the leader’s turn. Mend skill was not obvious due to skill message not appearing so it sometimes appeared the character was being healed by an attack. Usable items giving characters the benefit at all times. This was most obvious with the Trauma Kit reviving when the character dies, even though it must be used manually. It also happened with some of the nanites. Total Mayhem (Wrecker skill) sometimes being triggered when less than 3 pieces of cover destroyed. As stated above, controller support is the next highest priority. Beyond that, I do have plans to add more content to DOE in the future. I have a few classes that were cut at the end and I plan to finish them. I’d also like to add more mission variations and more maps. Many other requests have been made and I will definitely take a look at those as well. You may also notice that we reduced the price recently. Hopefully the new price will help ensure that the game continues to sell in the long term and allow me to keep going with (at least) quarterly updates.